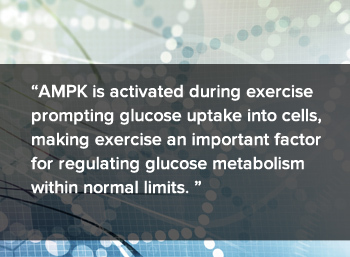 AMPK (5' adenosine monophosphate-activated protein kinase) is activated during exercise prompting glucose uptake into cells, making exercise an important factor for regulating glucose metabolism within normal limits. AMPK is an insulin independent mechanism.1 Insulin is the hormone that helps regulate blood glucose levels. When serum glucose levels are normally elevated due to dietary intake or ho-meostatic need, insulin is released from the beta cells of the pancreas to facilitate the uptake of glucose into cells for energy. During exercise, AMPK is activated which increases a series of enzymes, including GSK-3b (glycogen synthase kinase 3b), CRTC2 (CRE-binding protein [CREB]-regulated transcription coactivator 2) and FOXO1 (forkhead box O1) that play a role in glucose metabolism.2,3 According to DeFronzo and Tripathy, skeletal muscle is responsible for around 80% of insulin-stimulated glucose uptake.4 Exercise, like insulin, increases the glucose transport in skeletal muscle, resulting in glucose clearance from the blood through GLUT4 transporters in skeletal muscle. 1Hilder TL, Baer LA, Fuller PM, et al. Insulin-independent pathways mediating glucose uptake in hindlimb-suspended skeletal muscle. Journ App Phys. 2005; 99(6):2181-8. 2Zhang BB, Zhou G, Li C. AMPK: an emerging drug target for diabetes and the metabolic syndrome. Cell Metab. 2009; 9(5): 407–16. 3O’Neill, HM. AMPK and Exercise: Glucose Uptake and Insulin Sensitivity. Diabetes Metab J. 2013 Feb; 37(1): 1-21. 5Carling D, Mayer FV, Sanders MJ, Gamblin SJ. AMP-activated protein kinase: nature’s energy sensor. Nat Chem Biol. 201;7(8):512–8. 6Hardie DG. AMP-activated protein kinase: an energy sensor that regulates all aspects of cell function. Genes Dev. 2011;25(18):1895–908. 7Jensen J, Rustad PI, Kolnes AJ, et al. The role of skeletal muscle glycogen breakdown for regulation of insulin sensitivity by exercise. Front Physiol. 2011; 2: 112.